Paris, un voyage dans le temps is a collaboration between François Schuiten and the institute Passion for Innovation of Dassault Systèmes for the exhibition Revoir Paris. Their collaboration started with the La Douce album. This time Dassault Systemes made 3D projections of these three monuments, showing how these monuments will look like in the future projected by François Schuiten. 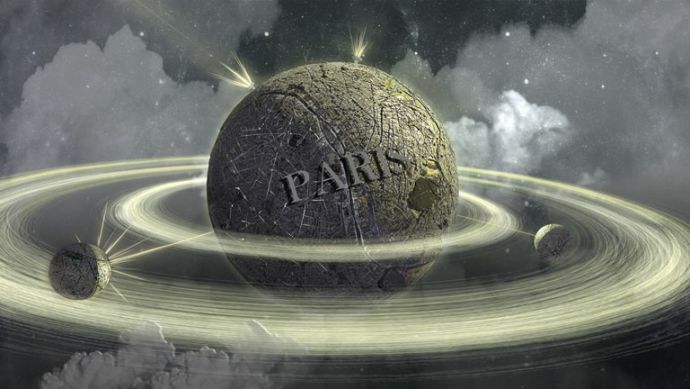 Visitors to the exhibition can help change the Parisian monument of their choice, venturing into the more distant past as in a hypothetical future designed by François Schuiten. This device is indicated by circular interactive projection screen, controlled directly by the visitor from a touch table. Dassault Systèmes made the following introduction video of the 3D animation. The 3D animation was shown during the Revoir Paris exhibition. On a huge round screen the animation was viewed and controlled by a touch screen. A video about the making of by Dassault Systèmes.